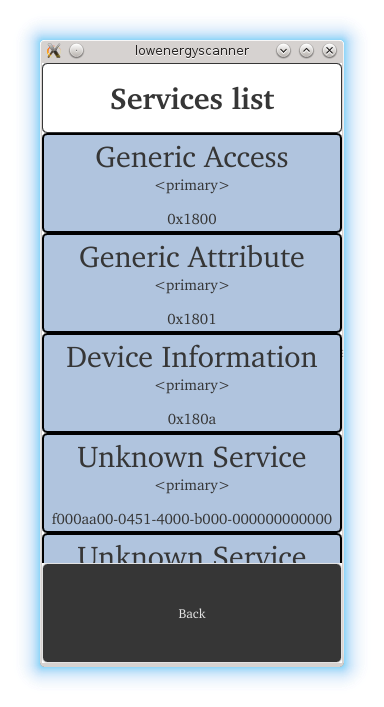 An application designed to browse the content of Bluetooth Low Energy peripheral devices. The example demonstrates the use of all Qt Bluetooth Low Energy classes. 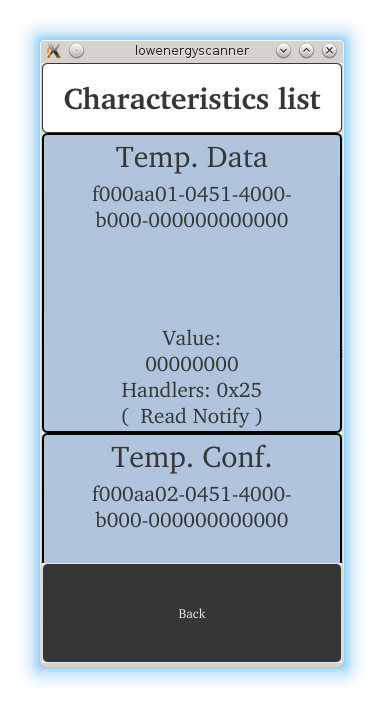 The Bluetooth Low Energy Scanner Example shows how to develop Bluetooth Low Energy applications using the Qt Bluetooth API. The application covers scanning for Low Energy devices, scanning their services and reading the service characteristics and descriptors. The example can be used with any arbitrary Bluetooth Low Energy peripheral device. It creates a snapshot of all services, characteristics and descriptors and presents them to the user. Therefore the application provides an easy way of browsing the content offered by a peripheral device. The below addDevice() slot is triggered as a reaction to the discovery of a new device. It filters all found devices which have the QBluetoothDeviceInfo::LowEnergyCoreConfiguration flag and adds them to a list which is shown to the user. The list of devices may look like in the image below. Note: It is a prerequisite that the remote devices actively advertise their presence. // Connecting signals and slots for connecting to LE services. The slot triggered by the connected() signal immediately calls QLowEnergyController::discoverServices() to start the service discovery on the connected peripheral device. 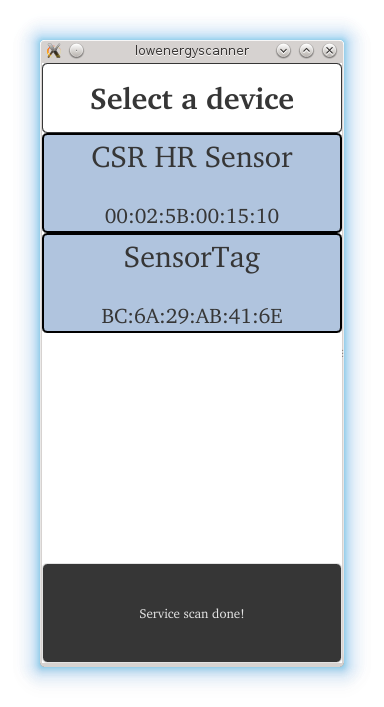 The resulting list is presented to the user.The image below displays the results when the SensorTag device is selected. The view lists the names of the services, whether they are primary or secondary services and the UUID which determines the service type. Upon selection of a service the service details are shown. Each characteristic is listed together with its name, UUID, value, handle and properties. It is possible to retrieve the service's characteristics via QLowEnergyService::characteristics() and in turn, each descriptor can be obtained via QLowEnergyCharacteristic::descriptors().